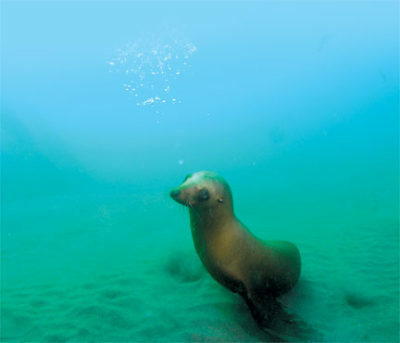 No animals encountered in the California underwater world are quite as playful as sea lions. Their big dark puppy-dog eyes will melt your heart. Their antics and playfulness will make you laugh into your regulator. And they will challenge your underwater photo skills to the max. Encounters can happen almost anywhere along the coast and out at the islands but only a few locations hold the guarantee that you will see sea lions. 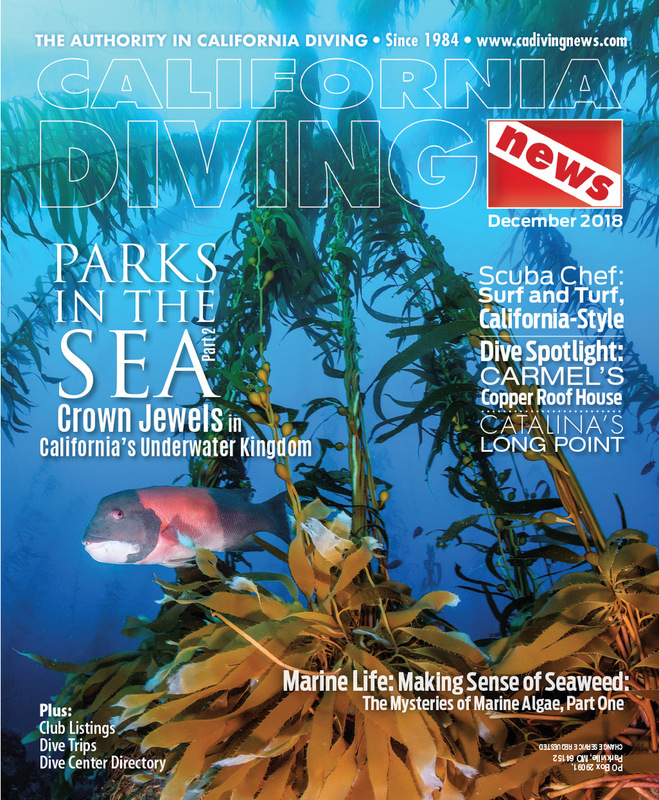 One of these locations, and the easiest to get to, is at Sea Lion Beach on Anacapa Island. On any given day dozens of sea lions, usually juveniles, will gather to see what us noisy and clumsy bubble-blowing creatures are up to. As many as there are in the water there’s still more on the beach. They form in loose groups of about a dozen on the surface. Then without a pattern of assault they’ll drop in on you with a roar of bubbles, a dive bomb flyby, or sometimes they will just sit on the bottom starring back at you with those sweet eyes. It is especially exciting when they sneak over the back of your head and spook you from behind. You’d swear you hear them laughing as you recoil in fright. Perhaps the most challenging part of diving with sea lions is holding their attention. To get them to stick around, you’ll need to be resourceful. Toss a rock and sometimes they will play a game of fetch. Spin around. Flash your dive light at them. Anything that makes noise will interest them, too. Photography is a particular challenge because they are nearly always moving at high rates of speed. It is like trying to photograph a racecar with no predictable track. You’ll need skill in panning as they buzz by you and a high shutter speed which, depending on your camera, means you’ll need to bump-up your ISO and/or open up your aperture which can be a problem in getting an in focus sharp image. Shoot a lot of images and you’ll likely to eventually end up with one or two that are good. There are two approaches to diving with sea lions. First, and the most common, is to sit on the bottom and wait for them to come to you. With this technique you have the greatest odds of close encounters and they might even sit still long enough for a shot. The disadvantages of this approach is you’ll be over sand, which the sea lions notoriously kick up, causing ruinous backscatter. And natural light on the bottom is not always as good. The second approach is to rest on or near the surface group. There is less debris and the natural light is better, but they don’t seem as willing to approach closely. The dive site at Sea Lion Beach is shallow, 25 feet or less so you’ll have a lot of time for photography or just playing. It is an excellent relaxed dive for the second or third dive of the day. Conditions here are generally only fair. Visibility is usually only around 20 to 30 feet because of the sand bottom and frequent surge. There are reefs to the west where the water clarity improves but the further you get from the beach, the fewer sea lions you’ll likely encounter. On the rocks and reef close to shore there is little marine life that is of any great interest, just some anemones and lots and lots of eelgrass. But there is one particular animal here that is of great interest — lobster. They love to hide in the eelgrass in shallow water, 5 feet or less. It will be surgy, and you need to be a good free diver, but they are there for the taking. And this is outside the preserve that encompasses many sections of the island. Follow regulations on size, limits, season and licensing. 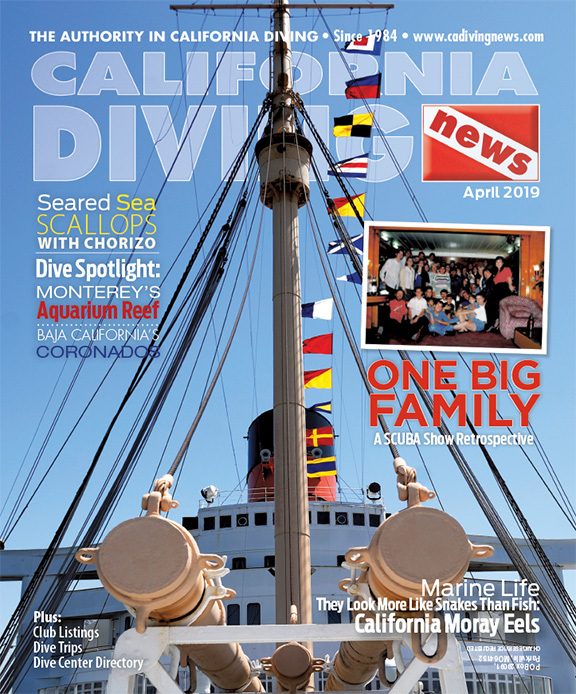 As always, check on the California Fish and Wildlife website (dfg.ca.gov/marine/oceansportregs.asp) for complete, detailed, and up to date regulations. Anacapa Island is actually a set of three islands with short sections of impassible waters between. They are East Anacapa, Middle Anacapa, and West Anacapa. Sea Lion Beach is on the ocean side of East Anacapa. Anacapa Island is the second smallest of all the eight California Channel Islands is the closest of all the islands to the mainland at only 11 miles. 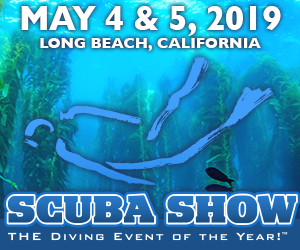 It lies within the heavily regulated and patrolled Channel Islands National Park and Channel Island National Marine Sanctuary. Several dive charter boats run regularly from Ventura and Santa Barbara. There are also launching facilities for private boats from these local harbors. Skill Level: Novice and up. Location: Ocean side of East Anacapa Island (GPS N34°00.705’, W119°22.176’). Entry and Exit: Generally easy but a south swell and make conditions poor. Visibility: Fair averaging 20 to 30 feet. Photography: Wide-angle of sea lions. Hunting: Good for lobster in shallows. Below is the active list of scheduled boat dive trips. Be sure to contact the charter directly for confirmation, rates, booking and other info. 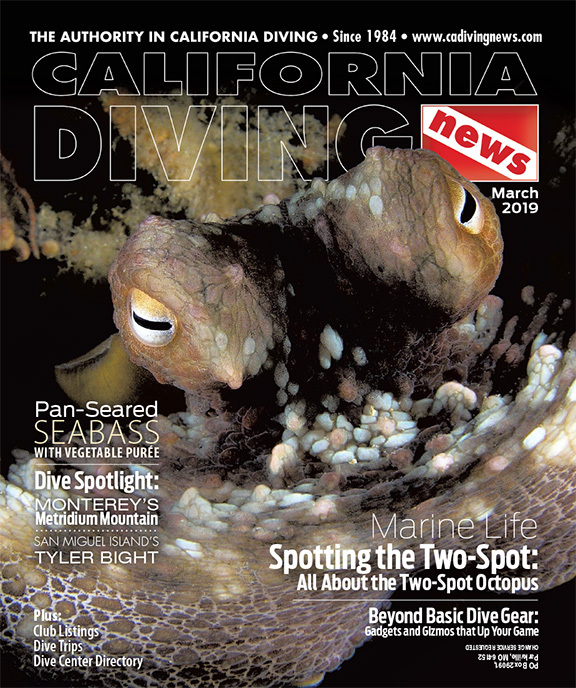 COPYRIGHT © 2019 CALIFORNIA DIVING NEWS. ALL RIGHTS RESERVED.Website hosted and managed by Make Me Modern.